Product #22139 | SKU TS4GSDHC10 | 0.0 (no ratings yet) Thanks for your rating! 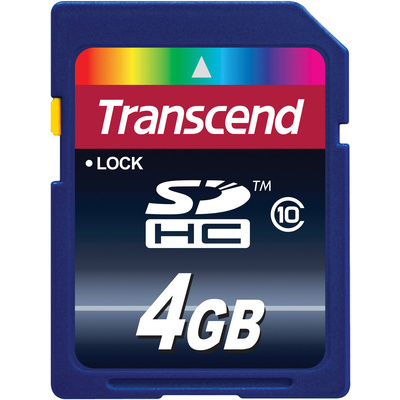 The Transcend 4GB SDHC Memory Card Class 10 is a Class 10 memory card for digital cameras, HD video cameras, portable media players, and other high-capacity devices. Transcend is committed to protecting your data by giving this 4GB card a mechanical write-protection switch, a built-in Error Correcting Code (ECC) for detecting and correcting transfer errors, and by allowing for In System Programming (ISP) for updating firmware. The card is also backed by a lifetime warranty for additional peace-of-mind.